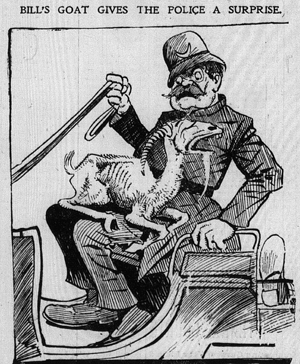 When the law, assuming the form of an expansive policeman, stepped between Bill Sullivan and his goat, the law had reason for regret. The law simply got the wind knocked out of it. Bill and the goat are features of life on Telegraph Hill and the fame of their mutual affection is crystalizing [sic] into one of the sweetest traditions of North Beach. They have been regarded as inseparable. Now cold, gray walls divide them. Bill is in jail and weeps to get out. The goat is out, and because of inability to get in raises the voice of lamentation. The pair undertook to help the glad New Year drift pleasantly to position on a flood of steam beer, but they miscalculated their capacity. Soon it was observed that the twain had taken more than any well-regulated man and goat have any right to try to carry. Small boys tooted discordant notes of jubilation at them. Bill could not actively resent [resist] them, but the goat was game. He charged upon the hosts of confusion and they fled in panic. Then Bill, congratulating the prowess of his companion, became too noisy, and a policeman lifted him into a patrol wagon. Having watched the affair with tolerable patience the goat concluded to participate. He gathered himself for a spring and he sprang. His hoofs came down in the wagon, his head struck the policeman just at the solar plexus, made him see stars, and formulate ejaculatory remarks derogatory to the goat family. The goat settled down in the wagon with every appearance of intending to stay as long as Bill did, and the policeman did not say him nay, having nothing left to say it with. At the jail the real trouble began. 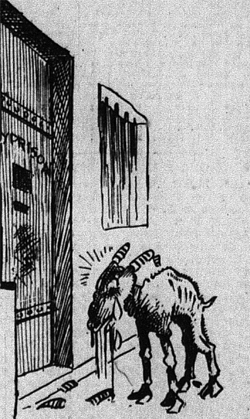 The goat wanted to follow his friend inside, but by an adroit move was headed off. He is not a goat easily to be baffled. 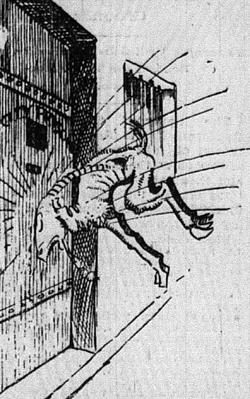 Withdrawing a few yards he lowered his horns and charged the iron door even as a battering ram the gates of Gaza. The impact jarred the door. Throughout the prison rang the sound thereof until suspicion arose that an earthquake had come to town. Again and again the goat shot himself at the door. People who drew near from motives of curiosity didn’t stay. Soon the goat was given all the room he needed. But a jail door guarded by a large goat of morose disposition ceases to be useful. Necessity arises for opening it occasionally, and necessity knows no goats. The two-horned dilemma had to be eliminated from the situation. No police duty was ever more clear, but some have been less difficult. If the beleaguered officers endeavored to peep out straightaway the door would be charged and get ajar. When one of them actually ventured forth he felt like a gladiator entering the arena, to do or die or go to the hospital. But the goat at last weakened a little. It had hurled itself against the hateful door so many times that experts estimated its spinal column to have been shortened materially. The police captured it and tethered it with a strong rope. Then did the goat bleat woefully, and, between whiles, eat of the restraining hemp. Plainly, the rope couldn’t last long. The uproar of the prisoner outside reached the ears of the prisoner inside and added to his other pangs that of an actual sorrow. As a final resort two brave men led the goat away, at intervals the goat varying the programme by leading them, and cached him in a livery stable, where at last accounts he was still expressing discontent and giving utterance to grief. And Bill, well Bill sheds tears and pines for the yesterdays when he and his beloved mate roamed in freedom among the uncanny alleys and the tin-canny heights of Telegraph Hill. Click here for the third and final part of our story, where we learn what became of Billy and Jack.